Published in PopPolitics.com and ZNet. Those with whom Didion places herself, in other words, were regular people who went on to lead ordinary lives. And they were the type of people, in their political disaffection, that she held in mind when forming her book’s thesis: That an elite group of pundits, lobbyists and operatives define the terms of “democratic” discussion in this country. That with the stories expounded in their press releases, C-SPAN speeches and Sunday morning talk shows, they create an accepted vision of “the American experience” that is, in fact, far removed from the actual concerns of the great majority of its citizens. These stories, the self-perpetuating “fables” of “the nation’s permanent professional political class,” make up the Fictions of the book’s title. Their consequence is the hollowing of democracy, the leeching away of people’s ability to meaningfully influence public decisions that affect their lives. 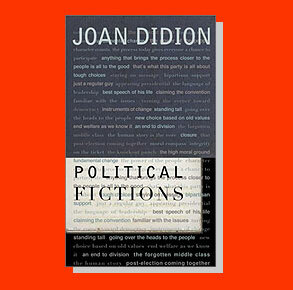 Didion’s collection contains eight essays, all reconstituted from material that she wrote for the New York Review of Books between 1988 and 2000. Each reads as an indictment. The essays pull into light different nefarious aspects of the “process” of mainstream politics (“The process,” in the words of an unflatteringly quoted Tom Hayden, that ostensibly “gives everyone a chance to participate”) and withers them under the magnifying glass of criticism. She indicts the media, too, for buying in to the system. Reporters sell their objectivity in exchange for “access” and end up as enablers, telling “the story not as it is occurring but as it is presented, which is to say manufactured.” Didion shows that drawing distinctions between the commentators hired by newspapers and the media managers on political staffs (a hallowed distinction in the journalistic world) is about as relevant as distinguishing paramilitary death squads from the dictatorial regime that sponsors them. Many of the essays are marked by the manner in which the author takes up strikingly commonplace contentions and advances them with brute force. Well after the time when any of these views might have made headlines, Didion argues vehemently that Ronald Reagan was more an actor than a leader, that the White House blatantly lied in order to cover up the massacre at El Mozote, that impeachment was politically motivated, and that Gore did poorly to disavow Clinton in his Presidential bid. And yet, her use of recycled ideas does not altogether lack ambition. It is as if she is trying to defend the sanctity of evidence and logic against the corrosive influence of political “spin.” Using the full weight of hindsight, she asserts that those arguments were not just partisan “positions” or disputed viewpoints. They were the truth. Her success in this endeavor varies from essay to essay. The measure of effectiveness for Didion’s criticism throughout her career has been her understanding of place. Her powerful cultural analysis from the 1960s was fueled by an ability to evoke a sense of her native California as an unsettling and inexplicably violent land. The same mood limited her when, in the early ’80s, she traveled to wartime El Salvador, a site where her shell-shocked sentiments were hardly original. Now, with Political Fictions, Didion turns to Washington, D.C., or, more precisely, “the beltway” — a constructed political locale that is more spiritual than geographic. And here she labors to pull apart the preferred narratives (“West Wing lights burn late as dedicated workaholics hit the ground running”) that the place uses to define itself. This effort, however, is hampered by the fact that the collection contains little reportage, particularly in its latter half. These essays were originally framed, at least in a general sense, as book reviews. The result is that the work moves away from politics. Instead it becomes a reflection on meta-politics — the rhetoric and self-image of the process, as presented in the memoirs and monographs and scoops published by political insiders. Writing in this mode Didion can brilliantly note that “the number of medals awarded” for the invasion of Grenada “eventually exceeded the number of actual combatants.” But even she does not discuss Grenada as a military reality. Rather it is something more abstract, a “symbolic centerpiece” used by conservatives to define Reagan’s foreign policy. There can be no muckraking here because the author, adopting the role of literary critic, keeps several layers of detachment between herself and the political muck. This, then, leads us to a final place that is significant in Didion’s work: New York. Since Political Fictions’ central argument deals with how Washington’s conversations are elitist and inbred, it is only fair to ask about the venue in which Didion herself is writing. At several points in the book, she undermines her original pose as an everywoman, going so far as to casually mention that she hosted Jerry Brown in her Manhattan apartment during a stop-over on his run as a presidential candidate. Such asides highlight what should be obvious — that having enjoyed more than 30 years of well-earned renown as a keen observer and impeccable prose stylist, Didion has not been leading an ordinary life. Indeed, she maneuvers within cosmopolitan cultural circles that are no less exclusive and self-contained than the political ones criticized in her essays. She may have once loitered away the hours in a gas station parking lot, but now she hangs out at the New York Review of Books. Nevertheless, Didion’s anger at political developments that many people, in advanced states of cynicism, have come to take for granted is genuinely refreshing. While she can’t quite pass as a real populist, and while she never quite dares to take up actual advocacy, her incisive criticism provides a valuable guide to a 12-year period in which smaller and smaller pools of voters mattered in the political process, and “half the nation’s citizens had only a vassal relationship to the government under which they lived.” Whether or not this constitutes a new trend, it is one worth combating. We don’t have to consider ourselves innocent to be outraged.